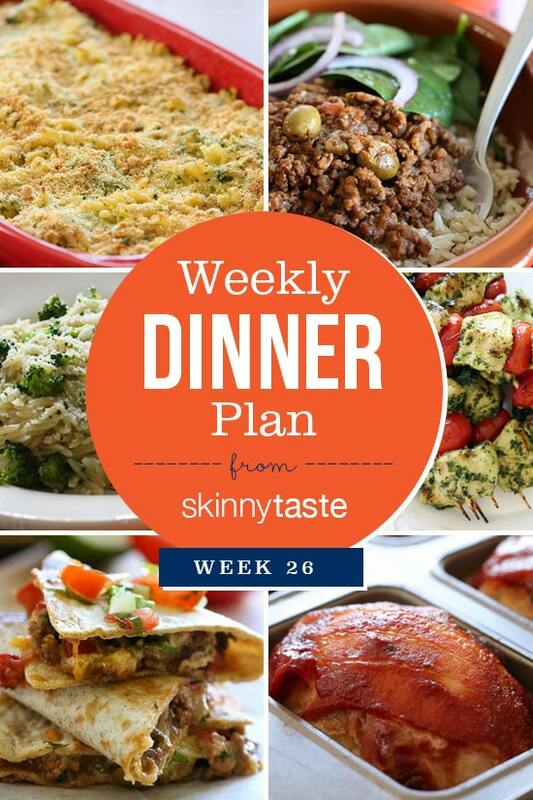 Skinnytaste Dinner Plan Week 26. You may notice Picadillo is back on my rotation this week. It’s one of my kids favorite recipes so I make it often. Leftovers are wonderful in quesadillas, tacos, empanadas and just about anything you can think of! 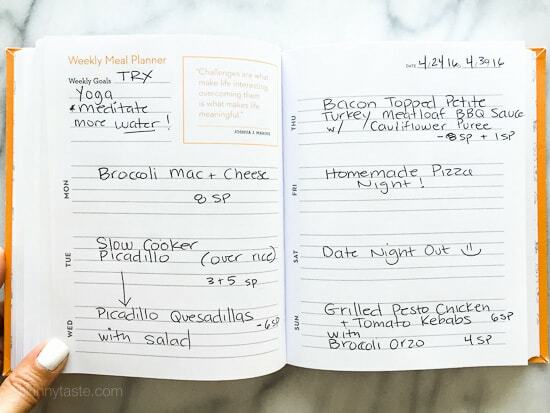 Pictured below is The Skinnytaste Meal Planner where I plan my dinners for the week (you can of course use any meal planner). Meal planning is a great way to get organized before heading to the supermarket to get ready for the week! My breakfast is usually something quick like eggs with fruit, a smoothie or avocado toast. We’re a family of four, so if a recipe serves more, it’s either packed up for everyone’s lunch or eaten the next day as leftovers. If you would like to see some of the previous week’s dinner plans, click here. just discovered your meal plans and they are GREAT! Do you still track points? I would love to see what a whole day/week of all meals looks like. I recently joined weight watchers, and I’m still trying to figure out how to balance my points out for all three meals and snacks. Would love your ideas!! Points are listed on each recipe but not as a total for the meal plans. These looks so good. Do you have the quantities for all the items on the shopping list? this will help me know how much of each item to buy. and fit into my Weight Watchers menu planning. I’m so pleased I found your website! We had turkey meatloaf last week, and we’re having homemade pizza on Friday also! Unfortunately, we’re not going on a date night though. I hope you enjoy yours. Gina, can you share your homemade pizza dough recipe? Or do you buy a premade dough from a local pizzeria? I buy it from my local pizzeria, or I use Delallo’s easy dough kit!